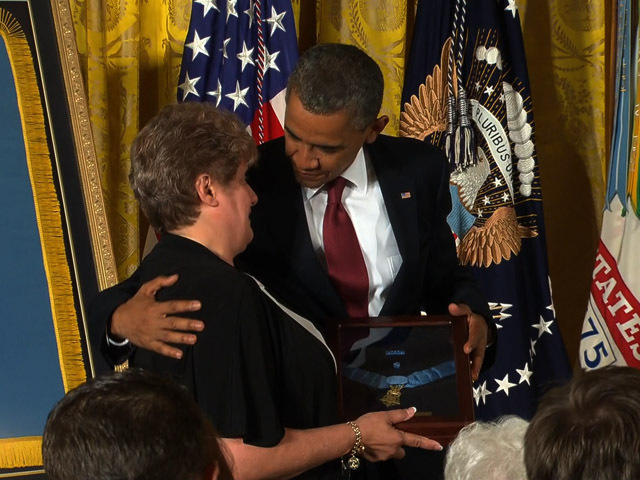 (CBS/AP) WASHINGTON - President Barack Obama awarded the Medal of Honor to a Pennsylvania Army specialist killed in combat in 1970 while serving as a rifleman in Cambodia during the Vietnam War. Spec. Leslie H. Sabo Jr. received the medal posthumously for heroic action when his platoon was ambushed by North Vietnamese forces in 1970 near the village of Se San in eastern Cambodia. "This Medal of Honor is being bestowed on a single soldier for his singular courage, but it speaks for the service of an entire generation and to the sacrifice of so many military families," said the president in his remarks at a White House ceremony Wednesday. "In his story, we see the shining values that keep our military strong and keep America great. You see the patriotism of families who give our nation a piece of their heart--their husbands and wives, their sons and their daughters. "And we see the devotion of citizens who put on the uniform, who kiss their families goodbye, were willing to lay down their lives so we can live ours in peace and in freedom. No words will ever be truly worthy of their service and no honor could ever fully repay their sacrifice." The citation was read out loud at the ceremony and Sabo's widow, Rose Mary Sabo-Brown received the medal on behalf of her late husband. "Although wounded by the grenade blast, he continued to charge the enemy's bunker," the White House account says. "After receiving several serious wounds from automatic weapons fire, he crawled towards the enemy emplacement and, when in position, threw a grenade into the bunker." In his remarks, Obama referenced the end of the war in Iraq and the upcoming end to the war in Afghanistan. "This month, we'll begin to mark the 50th anniversary of the Vietnam War -- a time when , to our shame, our veterans did not always receive the respect and the thanks they deserved, a mistake that must never be repeated," he said. Sabo's medal was a long time coming. The Army says paperwork for the award was done at the time of the war by George Koziol  one of the men wounded in the battle of Se San  but that it was lost in 1970 and did not resurface for three decades. Sabo served in Company B of the 3d Battalion, 506th Infantry, 101st Airborne Division. In 1999, Alton Mabb, a 101st Airborne Division Vietnam veteran, found the original paperwork while at the National Archives researching an article for the division's magazine. A few weeks later he asked archive personnel to send him copies of the paperwork and began the push to get Sabo recognized. Mabb confirmed Sabo's military records and awards using the Freedom of Information Act. He also began the three-year search for veterans of the Se San battle. He discovered that there was a three-year statute of limitations on Medal of Honor nominations that would require a congressional override.